HUNTINGTON — Many local students will find themselves staring longingly out the windows of their classrooms during the makeup snow days tacked onto their school year. Students in Gateway Regional School District, however, will be on the other side of those windows, basking in the sun. The reason for the earliest end to school for Gateway students in recent memory? “Blizzard bags.” Schools close June 14th in the district. Blizzard bags were first implemented in the state in Burlington Public Schools, and are really just assignments ready for students to take home when they’re likely to get snowed in. Orange, Petersham and Mahar Regional school committees have also approved blizzard bags, as have many other schools in states like neighboring New Hampshire. The result of those efforts is that Gateway students will only have to make up three of the eight snow days the district had this year. For Gateway Regional Superintendent David Hopson, the crux of the issue is how difficult it can be to keep kids focused and working on a summery day after testing has already finished, when students may feel trapped at school. “If you can get this done during the school year, it’s really a decent educational choice for kids,” he said. Hopson said the district contacted the state’s Department of Elementary and Secondary Education about its plans to use blizzard bags, and department officials said those decisions fall under the purview of local school committees. Gateway officials sent follow-up information about the program to the education department last week, Hopson said. The education department has laid out guidelines for what it prefers to call “alternative structured learning day programs,” which the department is open to as long as districts “can ensure that the program meets the standard for structured learning time and that the assignments and/or projects are substantial. “These programs must also be accessible, include appropriate oversight and teacher involvement rather than resembling traditional homework assignments, and be approved by the district school committee or charter school boards of trustees,” the policy states. 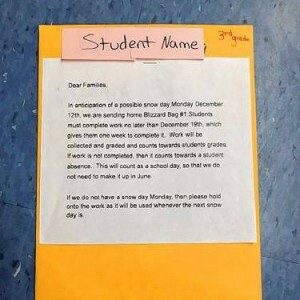 Students with special needs are given accommodations built into those assignments when possible, and if not, they are provided additional time and resources to complete those assignments when they return to school. “We’ve worked very diligently to make sure all the requirements of the IEPs and 504s are met,” Hopson said. Hopson is under no illusion that the blizzard bags are any kind of substitute for a full day in a classroom with a teacher. However, his district averages as many as seven snow-related cancellations a year, and the choice between completing those days with a blizzard bag and completing them during the summer is an easy one for Hopson.